The countdown has started for the next Tamahere Lions’ Best Artisan Market, indoors at Tamahere Community Centre on Saturday, June 23. Expect more than 60 stalls with food, craft, gifts, perfumes, cosmetics, clothing, and furniture for sale between 9am and 1pm. Another four indoor markets at the Tamahere Community Centre are planned for upcoming Saturday mornings on August 4, October 6 and December 1. Proposed changes to the Newell Rd-Cambridge Rd intersection are to be discussed at a public meeting in the Tamahere Community Centre. The changes under consideration could restrict the way drivers enter and exit the intersection. The NZ Transport Agency and the Waikato District Council propose making some changes as part of the work for the Waikato Expressway, which is to be finished by 2020. Tamahere Community Centre Committee will hold its annual meeting on Thursday, October 19, 7.30pm at the Devine Rd centre. The centre is a community building on community land and governed by a committee of local volunteers whose aim is to ensure the centre gets maximum community use. “We are in need of new members due to current members retiring and this is a great opportunity to become involved in your local community,” said committee secretary Paula Dunton. Tamahere Community Centre Committee will hold its annual meeting on Thursday, September 8, 7.30pm at the centre. The Devine Rd centre is a community building on community land and governed by a committee of local volunteers whose aim is to ensure the centre gets maximum community use. Locals are welcome at the meeting and urged to attend to support a vital community asset. A recent burglary at the Tamahere Community Centre and other suspicious activity around the school has prompted a call to keen-eyed locals. Tamahere School caretaker Allan Wickens asks that anyone around the school area, especially at night, look out for suspicious activity and report it to police. In recent weeks two large gas bottles were stolen from the community centre and a school air conditioning unit was tampered with. The annual meeting of the Tamahere Community Centre, that vital, much used facility at the heart of Tamahere, is being held on Wednesday, August 26 at 7.30pm. The Centre, on Devine Road, is governed by a committee of local volunteers, whose aim is to ensure it gets maximum community usage, continues to develop more facilities and features and is well maintained for future generations to enjoy. Locals keen to know and be involved in community activities will find the annual meeting a chance to learn more about this local asset. It will be another busy night at the Tamahere Community Centre on Tuesday, July 17 – two public events on the one night but the centre’s facilities are designed to be flexible. The Waikato District Council will host its second information evening about the controversial stormwater maps for Tamahere properties from 7pm to 8.30pm. Meanwhile, the hardworking group of local residents who keep the community centre running so well is having its annual meeting from 7.30pm. 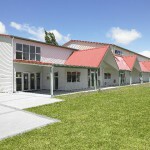 The Tamahere Community Centre needs community support. The five-year-old hall in Devine Rd, a vital and much used community asset, is run by a volunteer committee but several long-serving members are about to retire. A call has gone out for community-minded residents of Tamahere to step up and do their bit.